Although we’ve mostly covered Chuwi’s laptop and tablet ventures to date, the company has just announced the HiGame mini-PC, and it’s worth a look. Chuwi is stepping out of their comfort zone a bit here with a new desktop form factor, featuring the new Intel 8th Gen Core with Radeon RX Vega: basically Kaby Lake G with Radeon Graphics. Chuwi is well-known for low-cost laptops, but this move into the PC gaming industry seems like a wise one, and their first entrant has a lot of appeal. This appears to be a redesign of the GBox Pro that they showed off at CES. 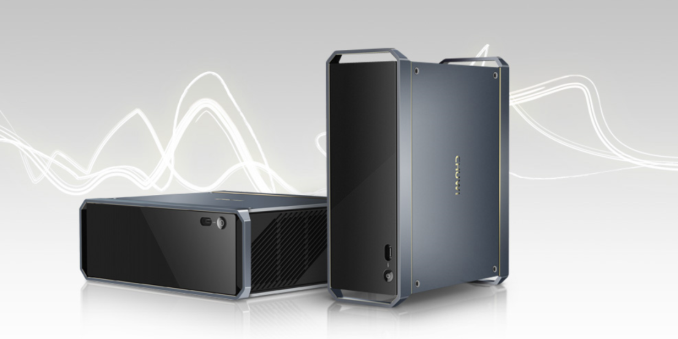 The HiGame is a 7-inch by 6-inch by 3-inch desktop, and is based around the 65 W Intel Core i5-8305G with Radeon Graphics. To keep the initial costs down, the device is configured with 8 GB of DDR4, and a 128 GB SSD, but both are upgradable. The Core i5 is a quad-core with Hyperthreading, and features a 65-Watt TDP for the CPU and GPU. The Radeon graphics feature 20 compute units with 179.2 GB/s of memory bandwidth thanks to the 4 GB of HBM2 memory. This should offer reasonable graphics performance, and Chuwi rates it about 30% quicker than a similar system with a GTX 1050 GPU. Although compact, the HiGame doesn’t skimp on connectivity. 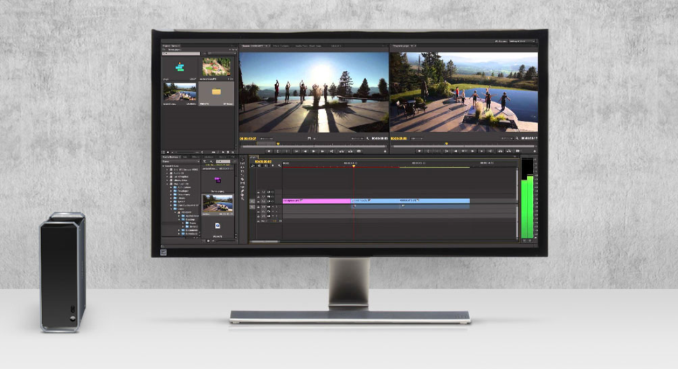 It features five USB 3.0 ports on the rear, along with Ethernet, two HDMI 2.0 ports, and two DisplayPorts, along with a microphone and headphone jack. The front features a USB-C Thunderbolt 3 port as well, so all the bases are covered. The design of the HiGame is industrial, and, at least in my opinion, quite stylish. Despite going into the gaming market, Chuwi hasn’t yet gone crazy with the styling, and this mini-PC should fit in well in almost any environment. Chuwi hasn’t set a final price or availability yet, but they are aiming for around $999 as a launch price, and availability in early July. The price is a jump up from what we’ve seen from their Atom powered laptops, but the KBL-G is going to account for much of the cost. We should be able to get our hands on this when it’s launched to provide a more comprehensive overview at that time, so stay tuned. It is surprising how good their products are. I have a dual-booting Android\Windows 10 tablet I picked up for $90. It's astonishingly good for the price. The 32GB eMMC is tolerable since their is a PCIe-based SDHC expansion slot I have a 128GB U3 card in, and 2GB RAM gets it by. But the real story is the build quality is shockingly good for something that cost less than $100, and it has been reliable and the Android distribution (4.4) actually got an update out of the box AND CONTINUES to get updates from Chuwi servers. I received an update to Android 7.1 about 6 months ago, not a huge delay in distribution when all things are considered. Granted, supporting Android x86 is easy because it only needs to be optimized to run on one architecture (Atom\Baytrail) unlike Android ARM where it needs to be optimized for hundreds of SoC's with dozens of different GPU's, modems, etc. But Chuwi has no incentive to continue supporting a 2 year old tablet that honestly isn't making them much money. I suppose I shouldn't be too surprised at the price point. It'd be interesting if boxes like this came down in price significantly (~$600) to where it could be considered an entry-level, mostly non-upgradable PC (can't swap out CPU+GPU, memory upgrades only benefitting heavy multitaskers, and storage upgrades limited to smaller form factors). You could easily hit the $600 price with an AMD 2 2400G. The catch is that it will draw twice as much power (expect a mobile edition sooner or later, but with an obvious performance hit). It also will only provide ~1030 levels of graphics (although I suspect that the "1050" may be a slower mobile setup, 65W for both GPU+CPU is extreme). It might even require an AMD "base design" as the first design will require real engineering to get the fan quiet enough for use while cooling 150W (+ everything else) and everybody will copy the first working design. Yeah, I'm aware of the 2400G, but there's a knowledge and lack of self-confidence that acts as a barrier of entry for the general market when it comes to do-it-yourself PCs. (Even though they may not realize it's just adult legos when it comes to piecing together components, and sites like pcpartpicker make choosing compatible parts easy as pie.) Even the NUC, with the supply-your-own RAM and storage space is a barrier of entry to those same peoples. It'd be nice if the bottom of the barrel PC included specs similar to this for really low prices. It'd really open the market up to new people, even older generations that may just want a new, small, quiet PC for checking e-mail and pictures of family on FaceBook or something, when their PC is actually capably of sustainable performance on low-settings 1080p games. HBM2 memory is expensive, but from what I understand, it looks like the Intel CPUs with Vega graphics are really priced as a high-end product. That sort of makes sense - Intel needs to price these as a step-up from an equivalent CPU without Vega, and AMD wants to make money, keeping in mind that every time Intel sells one of these, they might make a sale at Nvidia's expense, but they're also not selling a CPU.